Flights can represent the biggest cost of your trips. Learning how to book the cheapest flights can increase significantly your budget for other experiences at your destination. Here’s a detailed guide on the best tactics to find cheap flights to anywhere. There is an overwhelming amount of search engines to find a cheap flight, and the prices are constantly fluctuating. Booking the cheapest flight requires knowledge, research, and strategy. But don’t worry! With this guide, you’ll learn the exact steps to save time and money when booking a flight. First, you will find a list of things you can do at the moment of your purchase to ensure you get the best deal. The second part is a list of things to do before booking your cheap flight. I mean actions and considerations while you are not necessarily thinking of buying a ticket in the immediate future. Using an airfare search engine is easy and can help you find the cheapest flights. There is no one-and-only search engine that will get you the cheapest rates 100% of the time. You need to search on a bunch of them to get a pretty good idea of the prices. – Always a good tool. You can search for flights to “anywhere” and for the cheapest month. Kiwi – Allows multi-city search and includes a guarantee for your money in case you miss a connection between different airlines! 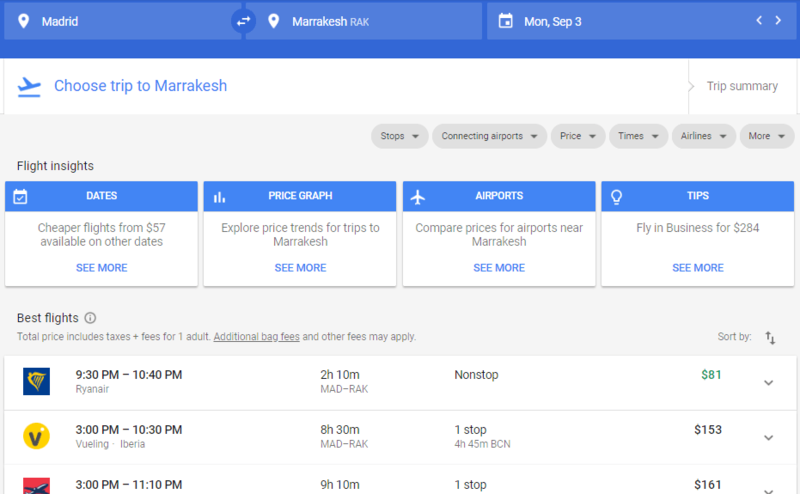 Google Flights – Easy to navigate to find the cheapest days. The map can also give you alternative routes. Momondo – Presents very good deals, especially around Europe. A lot of low-cost airlines appear on the results of these search engines. However, that’s not the case with all of them. Continue to the next tip to learn why is it important to find them. Low-cost airlines are very convenient, especially for short haul flights. Sometimes the prices are extremely different from a normal airline and you save big time. However, always read the fine print. Many budget airlines will add extra costs if you have a checked luggage (instead of just a carry-on), book your seat or not bring your boarding pass printed. They usually not include food, so you need to bring your own or pay a ridiculous price on the airplane. I’m sure there must be more low-cost airlines than these ones. If you know of one that is missing here, please mention it in the comments so I can add it! Budget airlines are frequently offering great promotions so check on them regularly. Whenever you search for flights on an airline’s website, your web browser stores their cookies. A lot of airlines use this to know you’ve been watching a specific route before, and then raise the price the next time you check it. This way they pressure you into buying because, hey, prices are getting higher. It’s very easy to avoid this by activating the incognito mode in your browser. In Chrome or Safari, incognito is enabled by hitting Control (or Command in a Mac), Shift, “N”. In Mozilla Firefox or IE, hit Control (or Command in a Mac), Shift, “P”. This will open a new window that doesn’t track your information (so prices remain the same). The easier it is for you to adapt your travel dates, the better. Airfares can fluctuate significantly from one day to another. The best way to know the cheapest day is by making a general search for the month(s) when you want to travel. 1 – Enter your departure and arrival cities. 2- Select “One-way”, even if you are having a round trip. It’s easier to understand which dates are the cheapest. 3- Click “Depart” and then “Whole month”. Click on “Cheapest month”. Then, hit “Search flights”. Skyscanner will automatically show you the best rates for the upcoming months. Repeat the same process for your return flight. You can do it as well searching for a round trip but looking for the flights separately gives you a better idea of the prices for each individual day. 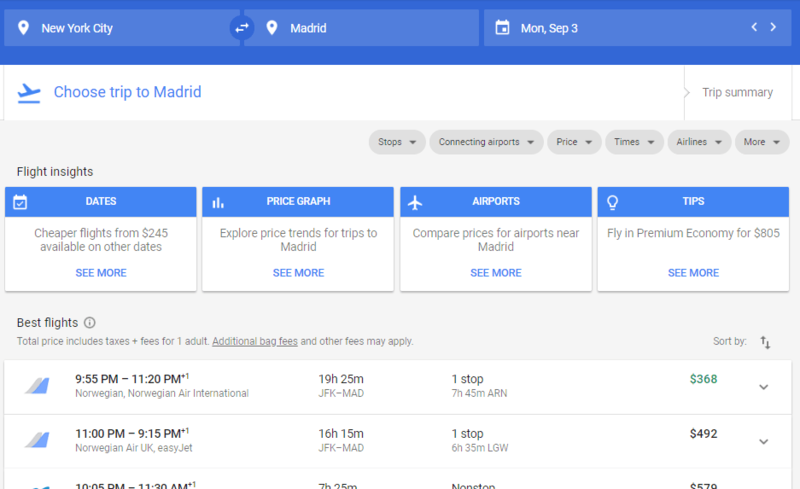 Kiwi, Google Flights, and Momondo also show charts and maps with a preview of the prices. Buying tickets separately have saved me some serious amount of money for flying long distances. 368 USD for the flight from NYC to Madrid. Now, let’s see how much it will be going to Marrakesh from Madrid. 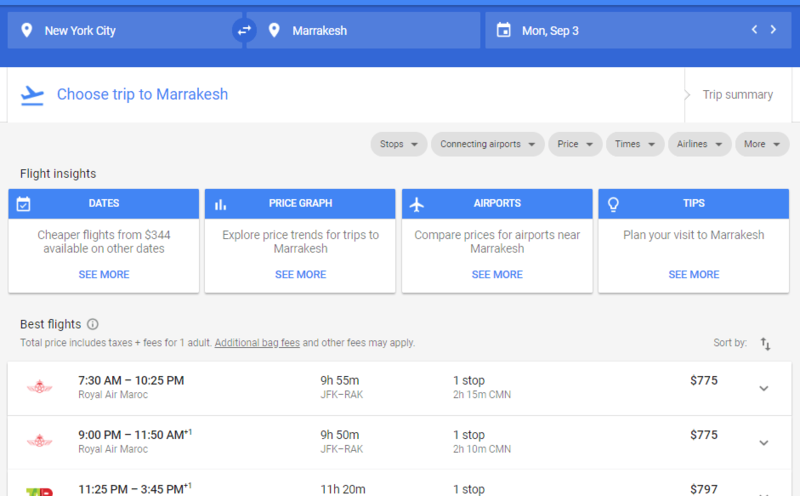 81 USD going from Madrid to Marrakesh. That is a total of 449 USD. You just saved 326 USD! You can even stay for a day or 2 in Madrid, and you would still spend less AND get to visit a different city. If you buy flights this way, you should keep in mind that you need around 5 hours at least between each flight so you can pick up your luggage, go through migration control, then check in again to the new flight. I prefer to stay at least one night to avoid problems in case of delays. Since you might be flying with different airlines, if one has a delay, the other airline won’t be responsible. Kiwi offers a guarantee in case this happens. is a search engine that gives you flight routes with long connections with the best prices. This way you can spend a day or an afternoon somewhere in the world before getting to your destination. Some months ago, I was booking a couple of flights for my boyfriend and me. I realized by accident that when I looked for “2 passengers” the prices were higher than when searching each separately. Why?? No idea why, but since then I’ve tried it several times and I confirmed it. Not 100% of the time, but it happens frequently that the price is higher when searching for 2 passengers at the same time instead of one by one. In short, when traveling 2 or more persons, book the flights individually. Booking the cheapest flight might require you to check the price on a different currency. Sometimes, when the airline’s site converts the flight cost, the exchange might add some extra money. Just make sure that your credit card is free of foreign transaction fees. Otherwise, your bank will make its own conversion and that might end up costing you even more than before. So far, these tips have been useful for the moment you want to purchase. Now, let’s get into how to find cheap flights BEFORE you want to buy. Have you heard of Travel Hacking? It is a great way to earn miles while having your usual, everyday expenses (like buying groceries or whatever) and exchange them for free flights or free upgrades. Banks everywhere offer credit cards that allow you to accumulate miles. I’d say USA banks have taken this to the next level and their offer has many advantages. I’m not based in the USA, so I haven’t dive into it but here’s a detailed guide to credit cards for travelers in the USA. If you are from another country, you probably at least have a couple of options for the biggest airline groups (like Star Alliance or Oneworld). You only need to research which airline and credit card are most convenient for you. Then, signup to their Flyer Program and to the card, and have your usual expenses. As everyone else in the world, I’m not a fan of being in debt! You can always pay all your monthly expenses IMMEDIATELY. That way, you won’t have added interests. I know travel hacking may seem confusing and overwhelming at the beginning, but believe me, once you understand how it works, it gets super easy! I’ve purchased more than 10 flights only with miles in the last years. It is worth it. Booking a cheap flight can seem difficult because of the ever-fluctuating prices of airplane tickets. When you find a ticket with a price that seems reasonable to you, how can you know if you should purchase? Maybe it will be cheaper next week, right? Well, the best way to know if you are in front of a good deal is to follow the prices over the course of +4 months. Prices rise during high season, but what happens the rest of the year? If you have in mind a few places you want to see, check the prices every couple of weeks. Once you are ready to buy, you will know if you need to purchase or wait longer. Another way to keep up to date with special discounts is by signing up for an airline’s newsletter. You can sign up to as many airlines as you want and send their email to a designated folder (on Gmail or Outlook). This way, they won’t clutter your inbox. Sometimes, airlines have amazing discounts that are accessible from their website and newsletter, but you don’t see them anywhere else. You will never miss their discounts if you join their mailing list. If you know you will have a trip in 1 month from now, but you don’t know if the price is good or not, chances are you should buy the ticket as soon as possible. The closest you are to the departure date; the more expensive tickets tend to get. If there are still months ahead, you can observe prices for some weeks, and then decide. Usually, prices won’t get cheaper after 6 to 8 weeks for the departure date. When it comes to miles, buying ASAP will always get you better deals. Last month I bought a ticket from Sao Paulo to Lima for 9K miles. Now, the same flight is only available for 45K miles! While flying on Tuesdays is usually cheaper than on Fridays, it is not written in stone. There are many rumors about how to find cheap flights, but the truth is there is no magic formula. I remember one time, many years ago, refreshing my browser every few minutes because I read somewhere that airlines drop their prices at 12am. I was so confused because I didn’t know in what timezone was this, so I was trying all day LOL. Don’t go to the airport without buying a ticket, hoping that the airline will desperately sell you a seat for half the price because they didn’t sell enough. Don’t pay attention to urban legends. There’s no exact day, month, time or secret macumba to get cheap flights. Do you have some other techniques to save on flights? Any low-cost airlines missing here? Share the article to make flights more affordable to your friends!